An actuator is a motor that converts energy into torque which then moves or controls a mechanism or a system into which it has been incorporated. It can introduce motion as well as prevent it. An actuator typically runs on electric or pressure (such as hydraulic or pneumatic). The control system can be controlled mechanically or electronically, software driven, or human operated. What makes motors work? The rotor and stator assemblies. These are commonly known as the primary and secondary windings within the motor. Voltage is applied to the stator assembly � the primary winding � which results in inducing the flow of current to the rotor assembly, or the secondary winding. The interaction of these two creates a magnetic field which results in motion. There are two types of motors: AC motors, which commonly move at a constant speed; and DC motors, which move at variable speeds. The speed of an AC motor is determined by the frequency of voltage applied by the number of magnetic poles. Within the AC motor are the stator assembly and the rotor assembly. If the AC motor is an induction motor, the rotor rotates slower that the stator�s field. If it is a synchronous motor, the rotor and the stator move in synchronization. In DC motors, the rotor assembly rotates in an attempt to align itself with the stator assembly but is prevented by a part known as the commutator. At the precise moment, the commutator switches the rotor field while the stator assembly remains stationary. This provides the means to control speed and positioning. There are several types of actuators, each of which function somewhat differently from the other. Pneumatic motors are air driven, using either vacuum or compressed air, which converts energy into linear or rotary motion. Air pressure and flow determine both speed and torque. These are used in applications in which positional accuracy is not a requirement. Hydraulic motors move a piston through a tube using pressurized fluid. The higher the fluid pressure, the higher the torque produced. Hydraulic motors output linear, rotary, or oscillating motion but acceleration is limited. Hydraulic motors are typically inefficient, can be a fire hazard and require more than usual maintenance. Clutch/Brake motor functions by coupling a continuously rotating shaft with a load, stopping only when the load is uncoupled. While this motor is easy to apply, relatively inexpensive, and great for light loads, its acceleration is uncontrolled as well as inaccurate. Stepper motors (DC motor) are electromechanical, converting a digital pulse into rotational movement or displacement. While stepper motors are not good for varying loads and are typically not energy efficient, they are great for constant loads and positional accuracy. AC Motors (induction type) use electric starters to provide connections, startup, and/or overload protection. 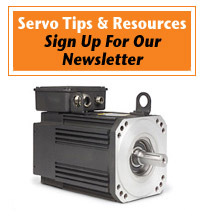 While Induction motors are more commonly thought of as having constant speeds, the introduction of microprocessor technology provides some variable speed capabilities. Servo motors (DC motor) are extremely high performing with few weaknesses. Servos provide speed control and position accuracy due to its feedback device, are small, and priced relatively low.